Ern and I picked up our lovely Poll Dorset ram from the effervescent Graham Langford in the Blackdown Hills today. 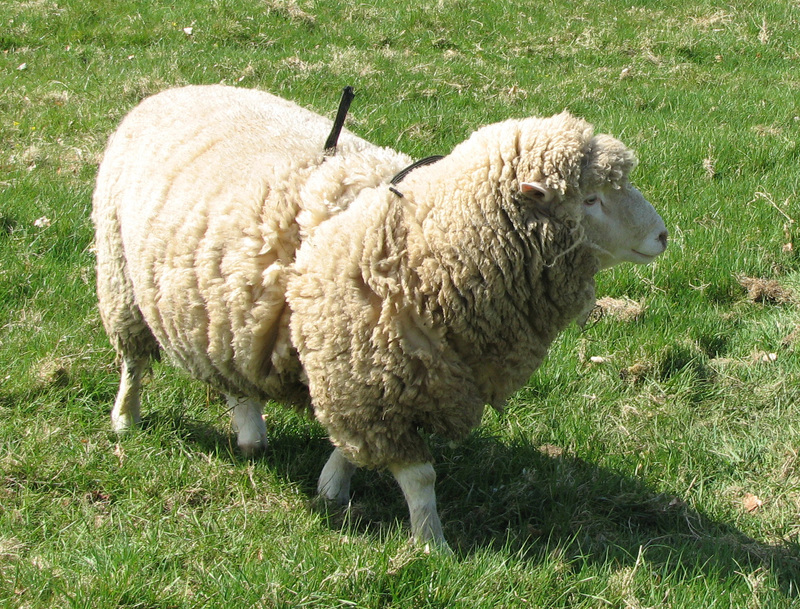 Here he is looking rather – well – sheepish (that’s the ram, not Graham). To recap briefly, I’ve gone for Poll Dorsets not only because I think they’re a cracking rare breed, but also because they will come into lamb at any time of the year. This means that not only are they superb for meadow management, but the lambs also reach higher prices at market. Lambs concieved now will graze the aftermath of the meadow after mowing and go to market in the New Year. We bought 5 ewes last year to get us started. Anyway, our ram needs naming. He has to begin with a K, so we’ve come up with a shortlist to choose from. If I’ve missed your favourite out please let me know and we might include it… Voting closes at midnight on Monday. I’ve blogged before about the meadow we’re putting in at Archie’s farm (‘Local seed for meadows’). Over the summer we’ve been preparing a corner of one of his potato fields for sowing – you can see the pictures here. The idea is that it will attract people’s attention, as it’s next to the A303, visible from the Eastbound carriageway about half a mile from the Sparkford roundabout. It will also act as a venue for our meadow management courses which start next year, allow us to showcase some interesting seed mixes, and, of course, create a stunning new meadow for Archie (and, with a bit of luck, the odd Shrill Carder Bee). Yesterday we sowed it. After a last minute weed and some tidying up of the margins with my trusty scythe we sowed two seperate mixes. On the western third of the site we are trialling a mix from the Blackdown Hills, which is as local as I can find and which should be fascinating. We hope to sell it next year, supplies permitting; it comes from Goren Farm, who currently supply our Yellow Rattle. Lots of Rattle in the mix, interestingly, and some beautiful grasses. We’re using well proven mixes for the other two thirds; our diverse Special General Purpose Mix of native grasses and perennials, over which we have sown Cornfield annuals as a nurse. These are both fantastic quality mixes from Herbiseed.